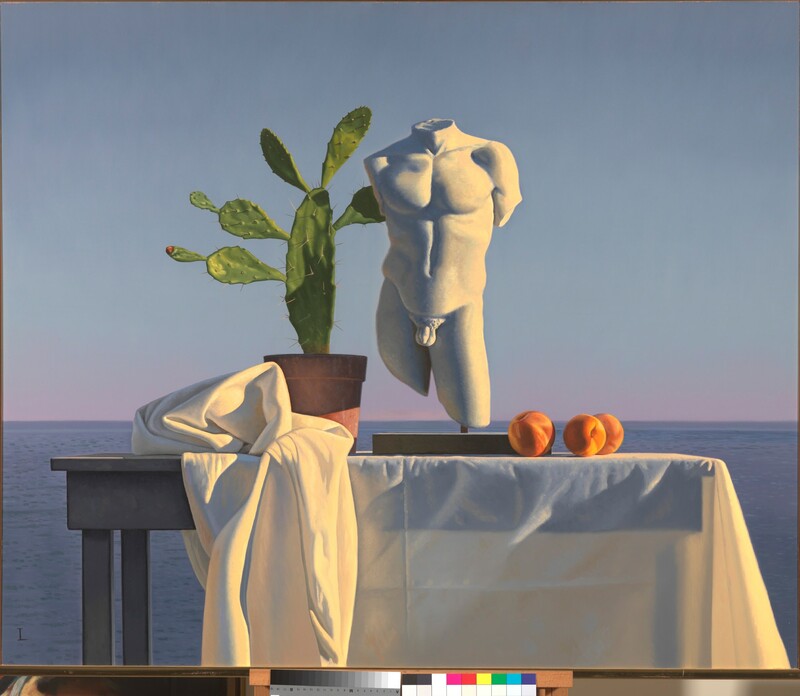 Plus One Gallery is pleased to announce its second solo exhibition by California artist, David Ligare. The exhibition entitled REDUX is a reprise of his "Thrown Drapery" paintings first shown in New York in the 1970's. At that time, art critic, Peter Clothier compared Ligare's thrown draperies to Rene Magritte's painting of a huge boulder floating above the sea, stating that, "the boulder's suspension is constantly unresolved and unsettling.. The thrown drapery, by contrast, suggests serenity. It does not defy gravity; it is in movement. Rather than expressing ironic timelessness it seems, by its very evanescence in light and texture, to belong in time and to define it for us." Although David Ligare has often been linked to Hyperrealism, he considers himself to be a classicist. His earlier drapery paintings were named after Greek islands but the purity of the activity as well as the relationship to the flowing drapery on white marble sculpture also add to the sense of Hellenism. And, like much Greek sculpture, the movement in the paintings is the record of a pause between actions; the drapery is suspended momentarily between its rise and fall, not unlike the upraised arm of Myron's Discobulous.. As Peter Clothier suggests, the draperies are IN movement but they are not OF movement. The artist also admits the influence of Los Angeles artist, John Baldassari's photographs of three red balls thrown into the air. 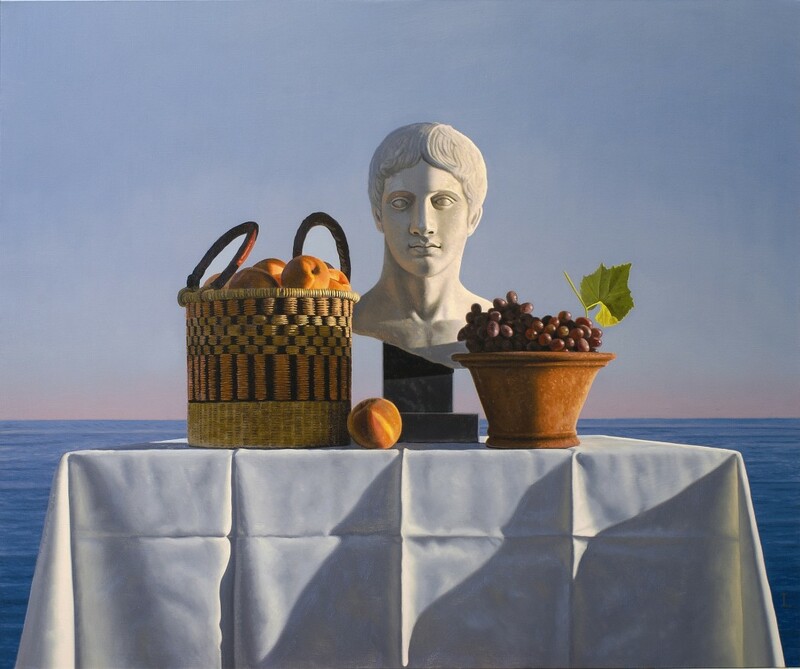 David Ligare has had over thirty-five solo exhibitions in New York, London, Los Angeles, Rome, San Francisco, Seattle and elsewhere and has been included in nearly one hundred group exhibitions all over the world. His work is in many public collections including the Museum of Modern Art in New York, The Fine Arts Museums of San Francisco, The Wadsworth Atheneum in Hartford, Connecticut, The Gabinetto Designi e Stampe degli Uffiizi in Florence, Italy and elsewhere. His work has also been reproduced in many books including on the cover of Simon Blackburn's philosophical treatises THINK and Truth and most recently, EXACTITUDE - HYPERREALIT ART TODAY, published by Plus One Gallery and Thames and Hudson.